Show that your organization values its employees and supports them in leading mindful lives by inspiring them with frequent support at a steady pace with interactive experiences.Create the potential for optimal performance at work by providing tools to create a fulfilling personal life. 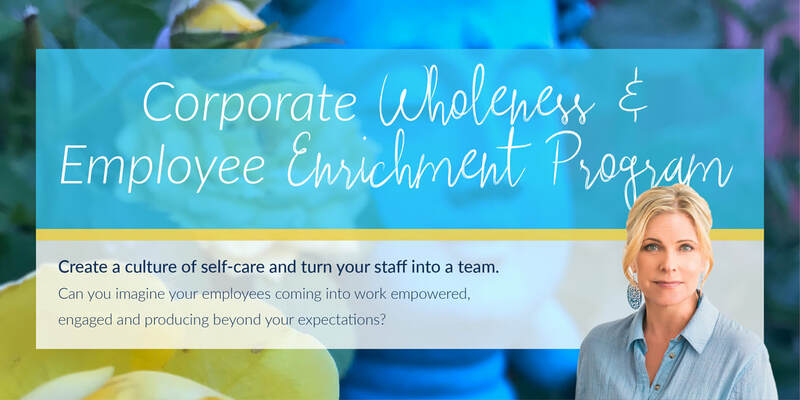 With the commitment of leadership the Corporate Wholeness Employee Enrichment Program brings insight and inspiration to each individual in their personal lives to manifest the optimal climate for success in their professional lives. Weekly newsletters with video clips, assignments & meditations as well as monthly interactive workshops and sharing circles. Begin with the 6 month Illumination Program and continue with business and individual customization and continued collaboration to enhance the individual and increase productivity. Self Care- “Self Love is the Foundation of ALL evolution.” Awakening the Divine Self through self care and the deepening of self knowledge. The Foundation; a daily practice of nurturing the four bodies allows us to begin the journey towards Self-Love. In order to open our hearts and receive unconditional love from ourselves and others. ​Desire and Deservability- “Manifestation happens when our Desires meet our Deservability.” Whatever your desires are; a more intimate relationship, a more fulfilling career, a healthier body or financial abundance, having the desire is not enough. We must feel deserving of our desires and to raise our deservability we must practice self love. Soul Core Words - “If you want to live a more fulfilled life, raise your standards.” What principles are guiding your life path? When we define our non-negotiable principles we have a road map for our lives and every decision we make. We can move forward confidently knowing all decisions are in alignment with our highest good and allowing our lives will unfold in more meaningful ways. Soul Transformation - “When we align to our Soul’s Core, we are able to rise above our deepest fears and remove the obstacles blocking us from living in our truth.” We are always transforming,and shifting our energies consciously or sub-consciously. We Create situations that force change, but transformation is a choice. The five steps of transformation bring awareness to where we are in the journey, releasing the fear of the unknown. Divine Relationships- “Our relationships are a reflection of the relationship we have with ourselves.” In deepening and examining your relationship with self can lead you to more understanding and growth in every relationship in your life. Exploring our reactions to the issues within our relationship with self and others reveals the necessary shedding of projection and judgment, transforming all your relationships. Seva Project & Prosperity - “Prosperity is the by product of service” We are collectively paired for when we share our gifts with the world. prosperity is not a result it is a journey of divine alignment to our passion and purpose.